Santorini, also known as Thera or Thira, is a volcanic island, the southernmost island of the Cyclades. There are 13 villages on Santorini and fewer than 14,000 people, a number which swells during the summer months when Santorini's famous beaches are clogged with sun worshipers. From the map, you can see the volcanic structure that, before exploding, formed a single island. Why Go? Where else in such a compact space are you going to see some of the world's best beaches, spectacular scenery and reliably awesome sunsets, ancient cities, decent restaurants, quaff some of the finest wine you'll have in Greece, and trek atop a volcano overlooking it all? The tomatoes of Santorini are famous as well. Yes, the Santorini Tomato Industrial Museum will tell you the story of the special tomatoes and how they were grown without irrigation and processed into a paste using nearby sea water. In Greece, ferries are far more numerous in summer than other seasons. Beware of this when researching ferry tickets. The ferry from Piraeus (the port of Athens) will get you to Santorini in 7-9 hours. You can shave a couple of hours off by taking a catamaran or hydrofoil. Once on Santorini, you can get frequent ferry connections to other Cyclades islands as well as Rhodes, Crete, and Thessaloniki. From Rhodes, you can take a ferry to Turkey. Santorini's capital is Fira, which sits on the caldera side of the island perched on a cliff 260 meters above the sea. 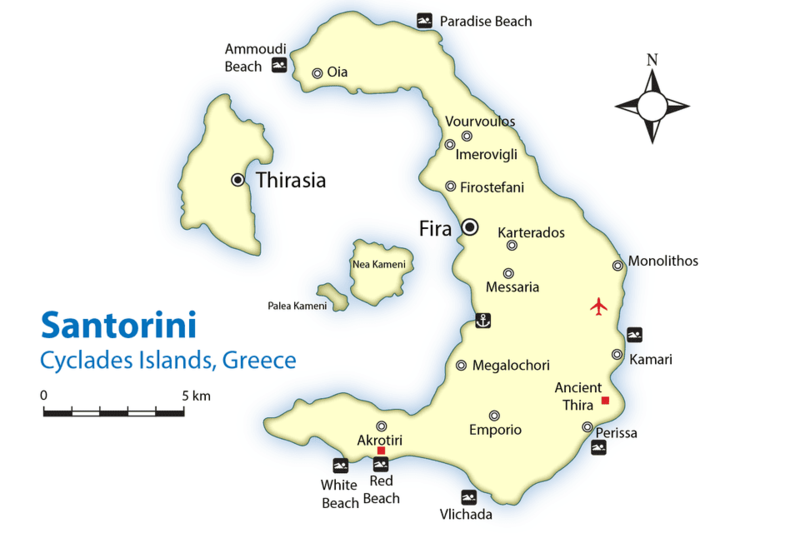 It hosts an archaeological museum with the finds from the Minoan settlement of Akrotiri, shown by the red box south of the modern village of Akrotiri. The Megaron Gyzi Museum contains a collection of pictures of Fira from before and after the earthquake of 1956. Fira's old port is for cruise boats, the port further south (shown on the map) is used for ferries and cruise ships. There are the usual tourist shops with a heavy emphasis on jewelry in Fira. Imerovigli connects to Fira via a footpath through Ferastefani, where you'll get that Kodak moment when you look back. Oia is famous for the views over Santorini at sunset, especially near the Kastro (castle) walls, and is quieter than Fira, although it does get quite packed on a summer's eve. Many people think that Perissa has the best beach on the island, a 7-kilometer long black sand beach with lots of facilities for beach bums. Perissa has religious festivals on the 29th of August and 14th of September. Kamari has the island's other black beach. Both Kamari and Perissa have diving centers. If you're looking for a more quiet beach experience, difficult on Santorini, Vourvoulos in the northeast is about as good as it gets. Megalochori has several interesting churches and is a center for tasting the wine of Santorini along with Messaria, which also features lots of shopping for those of you who do that sort of thing on vacation. Messaria also features winding streets and characteristic churches as well as good tavernas. Emporio has a castle and winding streets that confounded pirates in the olden days. You'll find the Museum of Prehistoric Thera in Akrotiri, along with excavations from the 17th century BC found to the south of the modern city. The red sand beach of Akrotiri is near the ancient site and there you can catch boats to other beaches. Santorini is also a producer of fine wines. Jacquelyn Vadnais got a tip on a hot winery from a waitress, and her tasting at Domaine Sigalas Santorini is recounted in Yes... There Is Wine Tasting In Santorini, Greece. Santorini's climate is hot in the summer, but it's a dry heat--and there are many beaches waiting to help you dissipate that heat. In fact, Santorini is only one of two places in Europe to be classified as having a desert climate. Spring and fall is the best time to travel, but folks flock to the island in summer. Besides the Museum in Akrotiri, the two major archaeological sites on Santorini are Ancient Akrotiri and Ancient Thira. Ancient Akrotiri is sometimes called the "Minoan Pompeii" because of the huge volcanic eruption of 1450 bc. In Akrotiri, the people seemed to have escaped; no human remains have been discovered by archaeologists. Ancient Thira is high above the popular beaches of Kamari and Perissa. The town was occupied by the Dorians in the 9th-century bc. Romantics usually stay in hotels or villas with a view of the caldera, often in Oia and Firá. These can be expensive. Another option is to rent a villa on the island. Or how about a cave house?